Hybrids come with low tax and great fuel economy. HYBRID CARS COMBINE a petrol engine with an electric motor to give you the benefits of both powertrains: good fuel economy, smooth, quiet performance and a long range. There are many advantages to having a hybrid car, the main ones being low fuel consumption and reduced CO2 emissions – both of which can benefit your pocket as well as the environment. Here we pick five hybrids on the market right now for a variety of budgets. The Mitsubishi Outlander Plug-in Hybrid Electric Vehicle (PHEV) is a comfortable and spacious five-seat SUV. It is powered by a 2.0-litre four-cylinder petrol engine and twin electric motors paired with a CVT gearbox. It has a claimed combined fuel economy figure of 1.8 litres/100km (157mpg) and costs €170 per year to tax. The Volkswagen Passat GTE is a plug-in hybrid and is powered by a 1.4-litre TSI engine delivering 153hp and an electric motor producing 113hp. Together, the two units generate 215hp. In all-electric mode, the Passat GTE has a range of up to 50km and a range of more than 1,100km when the tank is full and battery fully charged. It has a claimed combined fuel economy figure of 1.8 litres/100km (157mpg). The Hyundai Ioniq Hybrid is powered by a 1.6-litre four-cylinder GDI petrol engine with 32Kw permanent magnet synchronous motor and 1.56kWh lithium-ion battery. It has a top speed of 185km/h and Co2 emissions of 92g/km and costs just €180 a year to tax. The Niro Plug-in Hybrid pairs a 1.6-litre GDI petrol engine with a 8.9kWh lithium-polymer battery pack and has a 44.5kW electric motor. It has low Co2 emissions of 29g/km (combined New European Driving Cycle) – and the car offers a zero-emissions, pure-electric driving range of 58km. Rather rarely among plug-in hybrids, the Niro PHEV comes with a six-speed double-clutch transmission which allows drivers to shift gear for themselves, if they so choose. 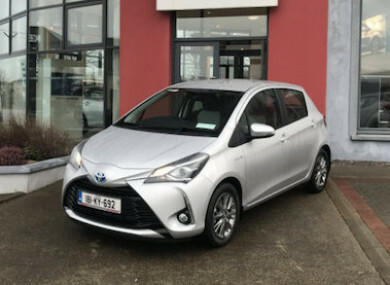 The Toyota Yaris Hybrid is one of the most sensible cars you can buy if you live in an urban/suburban area. It is a full hybrid meaning the two power sources can work together to drive the vehicle or can each be used in isolation. The Yaris Hybrid can disengage the petrol engine entirely and run solely on battery power in EV mode for 2km up to a speed of 50km/h. That means it is perfect for the crawling speeds experienced in most Irish cities. Email “5 hybrid cars for smooth economy on a range of budgets”. Feedback on “5 hybrid cars for smooth economy on a range of budgets”.